Fancy a romantic break at a tranquil, Cornish glamping hideaway? 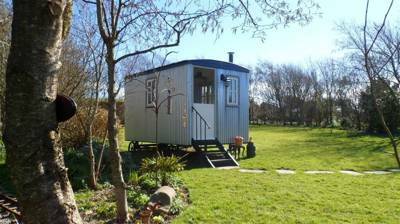 Just a few minutes south of Newquay and easily accessible for the A30 gateway to the coast, Wild Flower Cottage boasts two charming abodes in the 'Ooh La La Shepherds Hut' or the new, beautifully-restored gypsy wagon, 'Poppet'. Both come fully-insulated and double glazed, while their interiors are the epitome of style and comfort. And because this peaceful garden setting is for the adults only, there's no waiting in line to ride the working miniature railway that chugs around this gorgeous site! So, for your chance to win a week long break at Wild Flower Cottage, plus a kayak adventure for 2 courtesy of Koru Kayaking in St Agnes, simply leave a review on the Cool Camping website. Competition ends 17th June 2014. 3. Competition Details. In order to qualify for this competition, entrants must submit a user review (50 words minimum) via the www.coolcamping.co.uk website, based on any campsite or place listed on either website. The competition will begin at one minute past midnight (00.01) in the early morning of Tuesday 20th May 2014. Any reviews submitted before that time will not be eligible. 3. 3 The closing date for this promotion is 17th June 2014. Any reviews submitted after this date will not be eligible. Reviews received up until midnight on 17th June will be eligible. 4. Prize Details. Prize consists of a 1-week break for 2 people to stay in either the Poppet gypsy caravan or or Ooh La La Shepherds Hut with Duchy Holidays (subject to availability). Prize also includes 1 tandem Kayak Adventure for two people with Koru Kayaking in St Agnes. Prize must be claimed within 12 months of being awarded. If the sea conditions are not favourable on the day, the excursion will be transferred to the south coast Frenchman’s Creek Kayak Adventure or re-organised for an alternative day.